Animal Welfare Sweden (Djurskyddet Sverige), with its nearly 9,000 members, is one of Sweden’s largest organisations working for animal protection. We are a non-profit organisation that has existed for over 100 years. 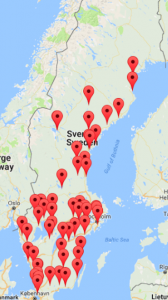 Djurskyddet Sverige consists of 47 member organisations, spread geographically over most of Sweden. Our vision is a society where humans show respect and compassion for all animals. We aim for all animals to be treated well, regardless if they live in the wild, are kept as pets or are bred to be food. All animals should be protected from suffering. When an animal is put down or slaughtered, this should be done without causing the animal pain. Our long-term work focus on affecting laws, regulations and individuals to benefit the protection of animals. We rescue animals and achieve immediate change by providing abandoned animals with new loving homes – this work is carried out by our local organisations that run animal shelters. Animal Welfare Sweden is a non-governmental organisation (NGO), not politically or economically connected to a political party. Our work is financed mainly by donations, inheritance and membership fees. Animal Welfare Sweden is inspected by Svensk Insamlingskontroll and has “90-konto” (90 01 06-6). Information in Swedish and contact information to all our member organisations.